This past Saturday the family jumped in the car and took a quick road trip. Now when I say jump, I mean decided at the last minute. When I say quick, I really mean two hours away to Savannah. The only real reason we went was because we had a little extra money and I was wanting to get at some fiber goodies. So off we went, little tourists that we were, on a two hour all highway drive. My husband was so fortunate as to not have to drive seeing as he let his license expire on his birthday this past December. Putting all these small details aside, the whole family traveled down the road. Our first stop was to a little shop called "Wild Fibre." When I say little it really just means its not as large as I would have wanted it to be. I did get a tidbits pictured here. 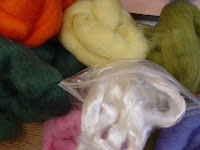 This is a small picture of the dyed wool bumps and some tencel. I couldn't remember if tencel is dye-able with acids but once I got home I found out it is not. Since I'm still enjoying the mighty fine benefits of apartment living, this end up natural but blended with some colored fibers. I think that I was a little disappointed. I mean two hours you think would merit a decent adventure but I think I had more fun after we left the shop. I met up with my friend and her son and his two friends. She moved down that way just about a year ago. Honestly, the store looked like it was a fiber shop that moved into a previous tenants domains. There was no real cohesiveness to the shop and the levels (i.e. odd step ups) where more of a detriment then an interior design element. Also, I'm thinking that some of these items are a little overpriced. I was just on Etsy and found this seller who sells tencel at 4 oz for 6.00. I paid over $12! Anyway, that was certainly a lesson learned. My LYS is better stocked for the spinning and weaving artist. Besides, she host our local spinning group and really like to show her that I support her business. The next time I head to Savannah, it will be to visit my friend and that's it! This is the beginning of my hand-spun single. 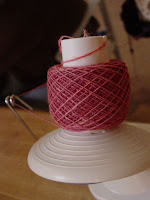 I noted in a previous post that I was spinning a handpainted roving from my store. This is my new ball winder (yay tax refund!) and the start of the winding process. It's actually all wound up now but I'm a little nervous about plying it. I hate to start plying a project and have to stop in the middle. If I have to wait till this weekend though I might go nutty! Decisions, Decisions! Stay tuned for continuing coverage of the "Great Yarn Debate of '08." I promise, more goodies and more bloggy-blog talking soon.